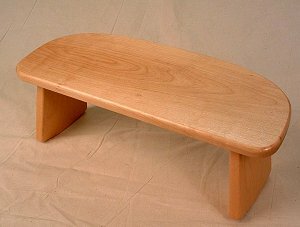 Our Deluxe Portable Meditation Bench has a larger more comfortable seating area and employs folding legs for convenient portability. The legs have a unique curved bottom edge so the mediator can rock slightly back or forward to adjust for perfect pelvis and spine alignment. Sustainable beech or ash hard wood with durable clear coat finish.